MIAMI GARDENS, Fla. — The Detroit Lions clustered on the bench under shade canopies Sunday, keeping their cool in the South Florida heat. And when they stepped onto the field and into the subtropical sunshine, they ran all over the Miami Dolphins. Injury-ravaged Miami (4-3) lost at home for the first time this season — and lost another key player when dynamic receiver Albert Wilson was sidelined in the first half. The Lions, meanwhile, held up well in the 88-degree sunshine. That was in contrast to the Chicago Bears, who wilted at Miami in an overtime loss a week earlier. Johnson carried 19 times and needed barely a quarter to reach 100 yards. 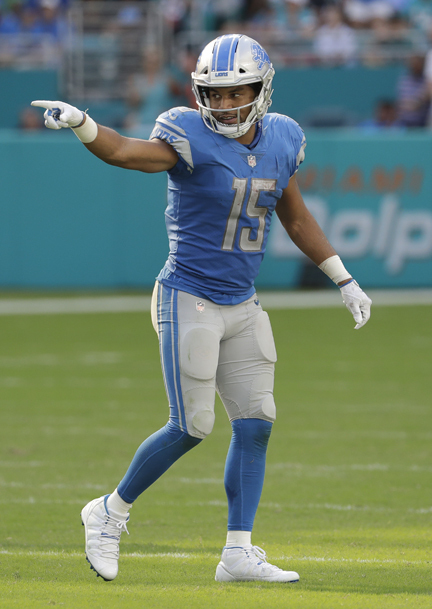 The rookie ran for 24 on Detroit’s first play and found a gaping hole on a draw for a 71-yard gain, the Lions’ longest running play since 2011, to set up a field goal. Detroit averaged 7.1 yards per rush.